TS Schools SA1 / Summative-I Exams Time Table /Schedule 2018-19 conducting guidelines. 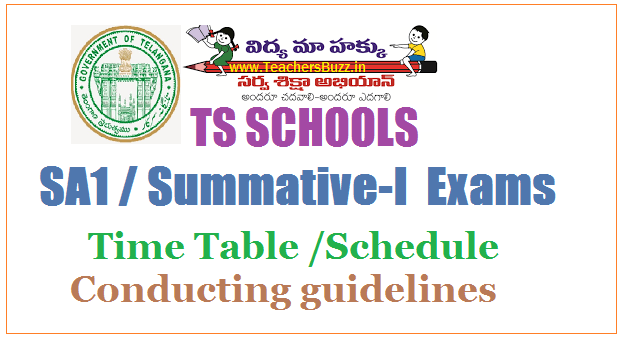 TS Schools SA1 Exams Time Table 2019-19 / Summative Assessment I Time Table/Schedule 2018-19 conducting guidelines. SA1,SA I, Summative Exams 2018 time table, Schedule, Summative Exams Time Table 2018, Primary Schools Summative Exams 2018 Schedule, UPS and High Schools Summative Exams 2018 Schedule, SA 1 Exams Schedule for PS, UPS and High Schools, SCERT, Telangana. As per he new academic calendar 2018-19 , the conduct of two Summative Assessments in an academic year along with other instructions pertaining to vacation, trainings, School Complex Meetings etc. Accordingly, the academic calendar was developed and provided to all schools along with dates for the conduct for Formative and Summative Assessments. As per TS Schools Academic Calendar and implementation of curriculum, Conducting of Half yearly examinations (SA-I) from from 1st October 2018 to 8th October 2018 to facilitate smooth conduct of examinations under invigilation from the teachers and correction of answer scripts, declaring the results in all Government, Government aided and private schools. Answer scripts to children and declaring results 23.10.2018. Cumulative Records to children by 25.10.2018. *తెలంగాణలోని అన్నిరకాల యాజమాన్యాల పాఠశాలల్లో సమ్మేటివ్-1 పరీక్షల నిర్వహణకు విద్యాశాఖ షెడ్యూలు జారీ చేసింది*. Therefore, all the DEOs are instructed to take necessary action on the above aspects and conduct exams seriously and confidentiality complying with the earlier guidelines issued by this office Proc.Rc.No. 7002/ A/C&T/SCERT /TS/2016, Dt: 01.09.2018. Further, they are requested to adhere to the above schedule and instruct the Headmasters and Teachers that after the summative test, the teachers shall identify the learning deficiencies in terms of attainment of learning outcomes communicated by SCERT by analyzing the students answer sheets. Serious effort shall be made to undertake remedial teaching/corrective measures to ensure the attainment of learning outcomes by the individual. The learning strategies like tutoring, individualized learning could be adopted. The RJDSEs and DEOs are requested to visit the field and monitor the activities both exam and post exam activities. They are also requested to send Compliance Report on the above to the undersigned and as well as submit compliance for the Proceedings of the Director, SCERT, Telangana, Hyderabad. TAGS: TS Schools SA I/Summative Assessment I Exams Schedule/ Time Table 2018 SA 1 Exams time table 2018, TS Schools SA I half yearly exams time table, #SA1,SA I, #Summative Exams 2018 Schedule, Summative Exams Time Table 2018, Primary Schools Summative Exams 2018 Schedule, UPS and High Schools Summative Exams 2018 Schedule, SA 1 Exams Schedule for PS, UPS and High Schools, SCERT, Telangana. As per he new academic calendar 2018-2019 the conduct of two Summative Assessments in an academic year along with other instructions pertaining to vacation, trainings, School Complex Meetings etc. Accordingly, the academic calendar was developed and provided to all schools along with dates for the conduct for Formative and Summative Assessments.